A look inside the new White Hart Lane. The postcode remains the same, but the sight that greets you as you step out of the White Hart Lane overground station confirms that London’s N17 has been transformed forever. A familiar set of kebab shops and newsagents that have been in place for as long as anyone can remember provide reminder of the Tottenham of old, yet the withered relics of this deprived area now look out of place alongside their glistening new neighbour. The soon to be branded Tottenham Hotspur Stadium is finally open for business and it stands proud as a magnificent addition to the London skyline. Built on the sight of their historic old White Hart Lane home, the silver bowl of this sparkling new amphitheatre sprawls on to Tottenham High Road, with the glass panels covering the outer walls of the main entrance glistening in spring sunshine as the venue staged a test event that is required for the club to attain a safety certificate to open their stadium for their home game against Crystal Palace on April 3rd. 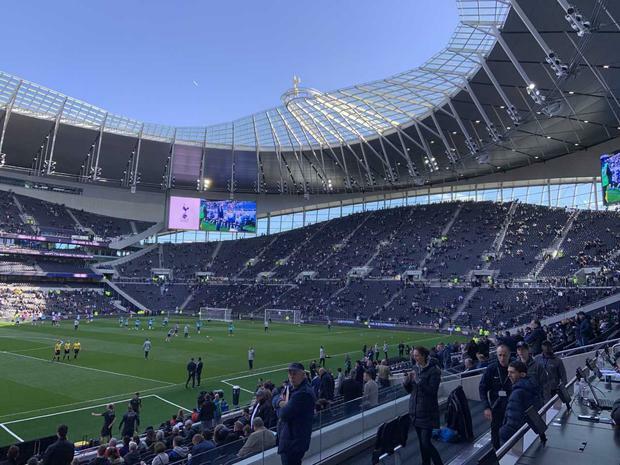 An under-18 game between Tottenham and Southampton side will never again be given a platform to compare to this, with the venue fit to host a Champions League final giving a soft opening that was a sparkling triumph for all involved. Tottenham’s stadium project has been a decade in the making and while the delays that ensured its initial opening date last September had to be abandoned, the first impression of this magnificent new home confirms the frustrating wait for the club’s owners, players and fans will be handsomely rewarded. Complimented by a club shop at the front of the stadium that is the biggest in football, the beauty of the exterior is trumped by the sights that greet you when you step inside the vast press room and then take your seat inside the stadium’s bowl. Unlike many modern stadiums, fans are close to the pitch and even though there was only 30,000 spectators in attendance for this test event, the noise generation by those in attendance suggests this stadium will be a cauldron of noise when it is filled for the Palace game in ten days time and then for the Champions League quarter-final against Manchester City. "We were crying when we left the old White Hart Lane and now we are crying again as we are coming home," declared Tottenham manager Mauricio Pochettino as he addressed the Tottenham fans on the pitch at half-time of the game that was a side show on a day when the stadium was the star of the show. "We are so excited to finish our season at this stadium and with 62,000 fans behind us we can realise our dream of getting to the semi-finals of the Champions League." While the 'what have they won' argument will haunt Tottenham until Pochettino’s talented squad convert promise into trophy success, they have been presented with a stage fit for champions to perform on. Now the Spurs manager and his players will be expected to provide the finishing touches to this highly ambitious project. * The 17,500-seater south stand is the biggest single tier stand in UK football. * Tottenham’s new stadium will be the first in England to operate a cashless policy for all purchases on match days. * A new phone app will inform fans where their nearest bars and restaurants are located when they are inside the stadium. * Food outlets and bars will remain open for up to two hours after them final whistle to help ease the rapid flow of spectators after matches.